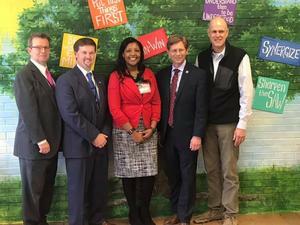 Alabama State Superintendent Dr. Eric Mackey visits Westside! Westside Elementary School was very honored to have Dr. Eric Mackey, Superintendent of Alabama schools visit on January 18. Westside Elementary School was very honored to have Dr. Eric Mackey, Superintendent of Alabama schools visit on January 18. While on his tour of WES, Dr. Mackey visited Mrs. Speegle's second-grade class and enjoyed learning how robots can be built from Legos and coded with ipads. Dr. Mackey also visited Mrs. Holley's art class while they were making 3-D snowmen using mixed media.